With the melting of the polar ice caps due to global warming, raising awareness of actionable items to combat the problem has become a top priority. Technology has played a role in this global warming and we all can do little things to help make sure the planet stays just a little cooler. 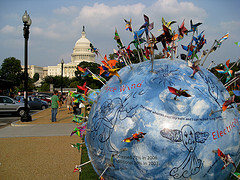 Cool Globes is a non-profit organization that aims to help raise awareness by rallying local, national and international artists to create "cool" globes depicting potential ways to cool the planet. I recently visited the Cool Globes exhibit as it traveled to Washington, DC and created video episode 44 for SOMEWHAT FRANK. Check out the video (below) showcasing the Cool Globes project. Also check out these photos from my Cool Globes visit. This video can also be found on: YouTube, Metacafe, Google, AOL Video, DailyMotion, Blip.tv and Crackle.